This slice of life from World War II came to us via Kyra's pop and his golfing buddy. Any time you can find a story that combines someone named Wild Bill, a coyote named Jeep and a real-life rescue, you have to pay attention. I hope you enjoy it as we remember the sacrifices America's service men and women have made this Memorial Day. During World War II more than 16-million American service members would be part of the fight. This is a story about two of those men. On December 29th, 1944. 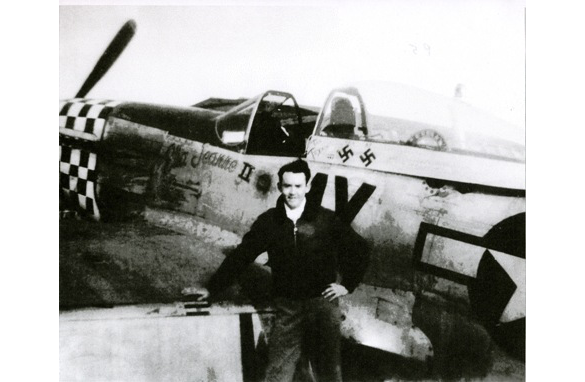 Lt. Huie Lamb, Jr. was flying missions in his P-51 escorting bombers over Germany. The 20 year old Texan was in the U.S. Army Air Corps operating out of Duxford Air Force Base in England. Photo Courtesy Huie Lamb. The p-51 is named after his little sister. One day Lamb's wing man lost use of his radio. Lamb was escorting the wing man back to Duxford when something went wrong over the North Sea. Lamb's plane lost coolant and caught fire. What should he do? He was too far from land to glide in. His next choice was to head into the wind and ditch the plane into the sea. By the time Lamb got his canopy open, it was too late to bail out. He slammed into the sea with his P-51. Fortunately for Lamb, Lt. John "Wild Bill" Crump was flying nearby. Photo Courtesy wildbillcrump.com Jeep flew 5 missions in WWII with Lt. Crump. Before I go on with Lt. Lamb's story, here's the shaggy dog, or to be more precise, the shaggy coyote story about Wild Bill Crump and his companion Jeep. 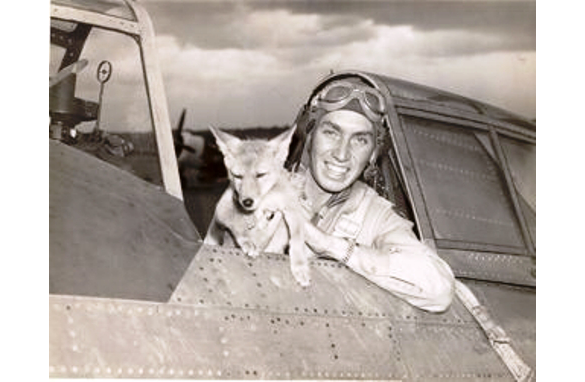 Jeep was a coyote pup Crump found and adopted as a pet during flight training in Nebraska. When Crump was sent to England in 1944 to join the fight, he smuggled Jeep aboard the Queen Elizabeth in an empty gas mask case. 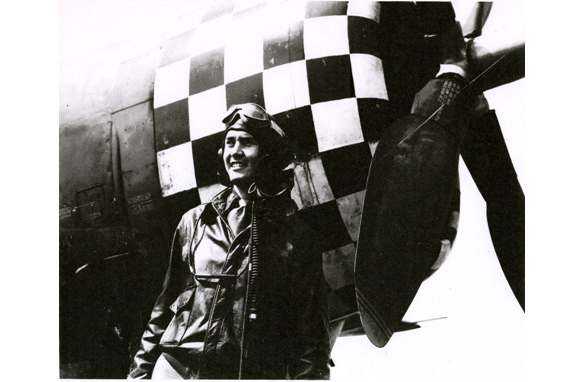 Jeep even flew missions with Crump during the war. You can read more about Lt. Crump and see more pictures of Jeep here. Lt. "Wild Bill" Crump, who was flying his P-51 nearby, saw Lt. Lamb's plane crash in the North Sea and called a "may day" for help. An amphibious plane was dispatched and Lamb was plucked from his disabled plane. Lt. Crump helped move him from the plane to a waiting ambulance. Lamb told me that he was surprised his only injuries were hypothermia and a split lip. He got stiches and after a few days recuperating he was back flying missions. When I spoke with Huie Lamb Sunday evening he told me he never got to meet Crump face to face before he died last year but he talked with the fellow WWII vet on the phone several times. Lamb put it this way, "Bill Crump was an amazing man, not just because of what he did to save me." I agree. And I would add that 85 year old Huie Lamb and what he did during World War II are pretty amazing too. Great Story. Great Stuff. Great photos. Rest in Peace, LTC Crump & Jeep. Some of the strangest and greatest relationships occur, during one's time in service to our country. In Vietnam, I had a very interesting relationship with a monkey named George. P.S. My dad flew the P-51(though I'm not sure which version), during his service in WWII. He was permanently grounded due to a previously undiagnosed sinus problem, when at above 20,000 ft., he lost control of his plane when he lost conciousness, but pulled out of it at about 1,500 – 2,000 ft. He ended up in the infantry. Ya can't get more grounded than that.